How to Host a World Cup! 1. Kick people out of their neighborhood and put a super stadium in a place they once called home! There was just one problem: the 4,000 people who already live in that part of Rio de Janeiro, in a decades-old squatter settlement that the city wants to tear down. Refusing to go quietly and taking their fight to the courts and the streets, they have been a thorn in the side of the government for months. 2. Promise them better public transportation and then just don’t do it! Seven years have passed since Brazil won the right to host this World Cup. Then-president Luiz Inacio Lula da Silva vowed to use the tournament to shake off underdevelopment and modernize Brazil, a coming out party for an emerging power on the global stage. While some much-needed investments have been completed, Brazil has fallen far short of what it promised for the Cup and many Brazilians see it as a squandered opportunity regardless of what happens on the pitch. The signature project in public transportation was to be Latin America’s first bullet train, a $16 billion high-speed rail service linking Rio de Janeiro and Sao Paulo. It never made it off the drawing board. Working class Brazilians spend hours each day commuting on dilapidated transport. Their frustration is such that buses and trains sometimes get trashed and even torched by angry commuters when they break down. 3. When the going gets tough, import Haitian labor and make them work in terrible conditions! The union told Spanish newspaper El País that every week, around 15 Haitians go to it to denounce low wages, lack of safety and the precariousness of accommodations. “The lucky ones are hired by large companies with resources,” said Domingos Davide, president of Sintracon. “The problems are not with the stadiums or the job, [it] is with the smaller companies” that subcontract the work. According to Davide, urban construction in Brazil is going through a “subcontracting fever.” “Businessmen start a small company, get carried away and then they cannot finish their contracts, or pay their workers,” Davide said. 4. Got protestors? Club ‘em and Gas ‘em if the people don’t like it! 5. If that doesn’t get the job done, fine the f*** out of them! With the World Cup set to start in São Paulo on Thursday, Brazil’s largest city has been racked by work stoppages that have created an unprecedented crisis for the country’s already fragile labor system. 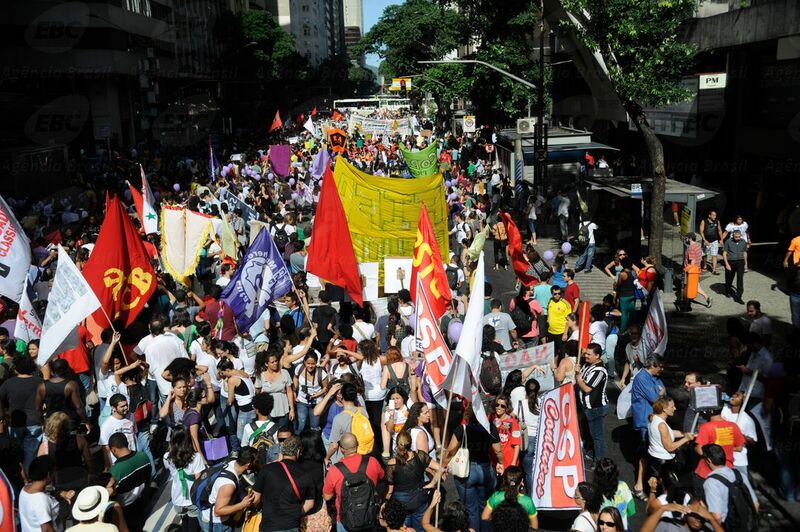 After a Friday in which striking mass transit workers brought the city to a grinding halt, São Paulo’s labor court ruled on Sunday that the strikes were not legal, reports the AFP. This was the first time in the history of the court that it had been opened on a Sunday to issue such a ruling, says labor judge Homero Batista Mateus da Silva. Even though the court ruled against the strikers, enforcing the ruling may be a challenge. The subway union has already scoffed at $44,000 fines levied by another judge for each day of full strikes. 6. Pass an anti-terror law that is reminiscent of the good ol’ dictatorship days! A new anti-terror law has been rushed through the Brazilian congress to deal with the protesters. It has been nicknamed Bill A1-5, a takeoff on the 1968 AI-5 Act, which gave extraordinary powers to the military junta and suspended key civil and constitutional guarantees for more than 20 years. The implementation of such a law opened old wounds. Brazilian President Dilma Rousseff was a member of a Marxist revolutionary group after the 1964 military coup d’état in Brazil. She was captured, imprisoned for two years, and reportedly tortured. It is a very important narrative for Brazilians. Her complicity in allowing the World Cup to proceed at the expense of the Brazilian poor is seen as a sellout of the poor to the rich. Congress, though, is now considering Bill 449, which would create a penalty of 15 to 30 years in prison for “causing or inciting widespread terror by threatening or trying to threaten the life, the physical integrity or the health or liberty of a person”. 7. Get the French to train your riot police! “French anti-riot police have begun training their Brazilian counterparts ahead of the 2014 World Cup and the 2016 Olympic Games, both of which are expected to provoke large demonstrations like those during the Confederation Cup held in Brazil in June, when millions protested against corruption and poor public services in the country. “We are preparing ourselves early,” said Marcos Palermo, a Brazilian anti-riot police officer. 8. Spend a bunch of money (that could go to public investiture) instead on an international surveillance apparatus! There are 170,000 or more security troops assigned to the World Cup—not to protect the thousands of tourists who will be coming to Brazil to watch the matches, but to quell dissent. Among them are a group of 40 FBI agents, part of an “anti-terror” unit. In January, French riot police were brought in to train their Brazilian counterparts. There are several Israeli drones, the ones used to chase down suspects in the West Bank, as well as 50 robotic bomb-disposal units most recently used by U.S. forces in Afghanistan. There are also facial-recognition goggles that police can use to spot 400 faces a second and match them against a database of 13 million. But there won’t be that many tourists, so exactly whom, people want to know, are the police checking? At a cost of nearly $1 billion, the international composition of the security measures is not only a contentious issue among Brazilians, but a cruel irony given FIFA’s mandate of bringing the world together through football. 9. Complain that all of this isn’t business friendly enough! The mayor of Porto Alegre in Brazil has revealed his city may be forced to pull out of hosting matches at this year’s World Cup over a lack of temporary structures at its stadium. José Fortunati admitted in an interview with a local radio station that the Estádio Beira-Rio is not yet ready to host matches for this summer’s extravaganza. He has demanded a bill that will exempt companies investing in temporary structures from paying tax, saying it is the only way for the city to raise much-needed funding. “This is the point which matters in terms of holding the World Cup in Porto Alegre,” he told Rádio Gaúcha. “If the bill is not voted, we will not have the World Cup in Porto Alegre. 10. Do all of this in the midst of an economic down-turn! Standard & Poor’s cut Brazil’s sovereign debt rating closer to speculative territory on Monday in a blow to President Dilma Rousseff, whose efforts to stir the economy from a years-long slump have eroded the country’s finances. Brazil had its long-term debt rating downgraded to BBB minus, the agency’s lowest investment-grade rating. S&P changed its outlook to stable from negative, meaning further downgrades are unlikely for now, which will come as a relief for both politicians in Brasilia and financial markets. In a rare, nearly three-hour-long interview with international reporters, Rousseff sounded broadly satisfied with her left-leaning government’s course ahead of a bid for re-election in October, though Brazil has fallen under a harsh spotlight ahead of the soccer tournament starting on June 12. Brazil’s economy has averaged only 2 percent growth since the former Marxist guerrilla took office in 2011, about half the pace that made it a Wall Street darling last decade. Many investors and business leaders say sweeping tax, labor and other reforms are needed to unlock a new era of growth. This entry was posted in Economy, Security Politics and tagged Dilma Rousseff, FIFA, Football, Soccer, World Cup by conjuncture magazine. Bookmark the permalink.